Everybody knows that listening to the language you want to learn is one of the best ways to practice and grow your vocabulary. That is why Spanish Pod 101 lessons focus on listening. 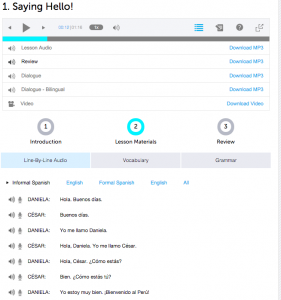 All the classes at SpanishPod 101 have audio files that start playing at your request, regardless of your Spanish learning level. You can stop the audio at any time, play it back, forward or even play it at a slower pace! This is particularly helpful when you are listening to new vocabulary and you didn’t understand the words or if you got distracted. When you click the play button of your Spanish lesson, you can see the timer and the back speed buttons next to it. The back speed button allows you to choose from up to 8 different speeds, making it easier to understand difficult or new vocabulary words. Spanish lessons at SpanishPod101 are taught by different teachers, which gives you the opportunity to broaden your knowledge. You will learn to differentiate accents, mannerisms and pronunciations. Another great way to improve your listening skills! The timer button is also very helpful. It will let you know where exactly is the Spanish word that you didn´t understand, so you can re-play the audio from that moment on as many times as you might need or want. There are even more options to increase your listening skills at SpanishPod101. For example, I found the Dialogue and the Review audios under my Spanish lesson. The Dialogue button allowed me to concentrate on the words and phrases, and I could listen to both Spanish and English sentences on the Review button. I am a visual learner and I learn faster when I can read the phrases while listening to them, and that is exactly what I do at SpanishPod101. 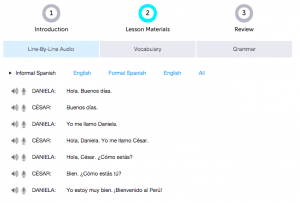 In each lesson, under the “Lesson Materials” tab, you will find the “Line by Line” audio. This was especially helpful for me. I could read the sentences while listening to them one by one. A great way of practicing the sound of new or difficult vocabulary words or if there is a specific word you are having trouble pronouncing or understanding. Since SpanishPod101 allows you to work with several learning methods to increase your listening skills, I would suggest you spend a good amount of time working with the one that suits you best. Remember that the best way to learn is to enjoy the process. Find out what is it that you enjoy the most and work on it after your finished your lesson.